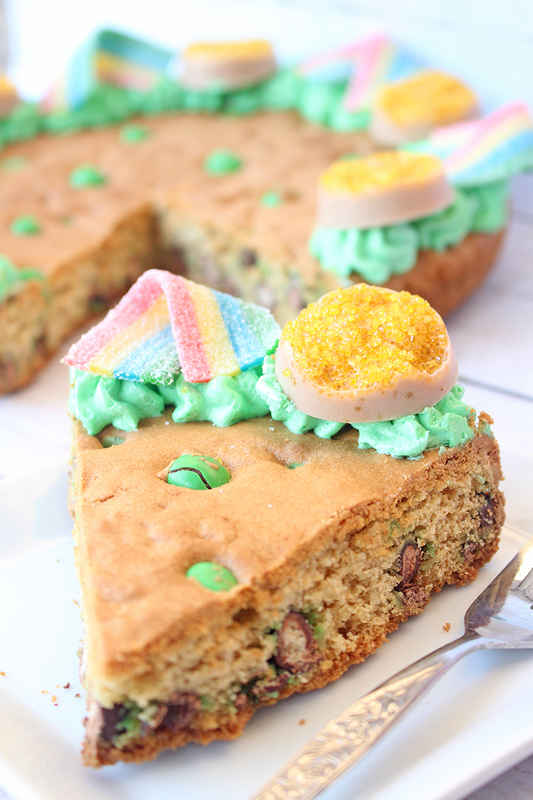 Although we don’t generally celebrate St. Patrick’s day in our house it’s really fun to come up with ideas, and sweet treats for the whole family to enjoy! 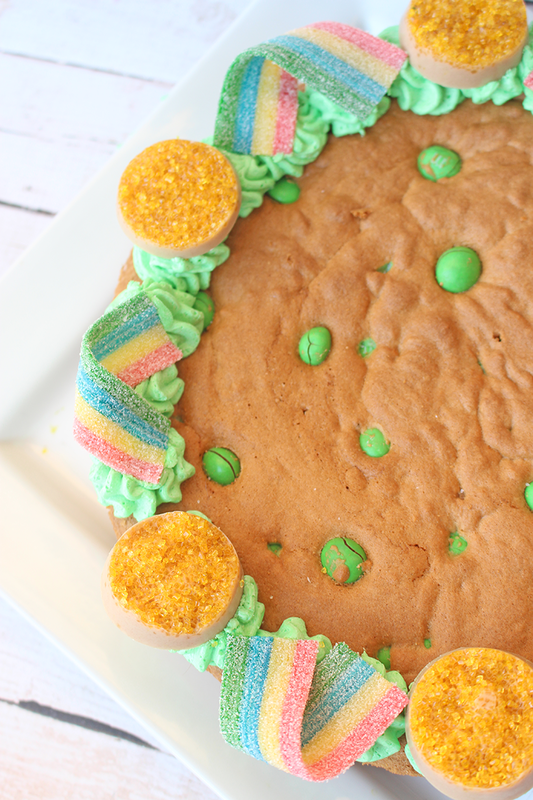 My husband and I have been working together at this baking/photography thing for the blog and this time around we came up with a delicious Cookie Cake that is perfect for St. Patrick’s day and I am so excited to share it with you today. 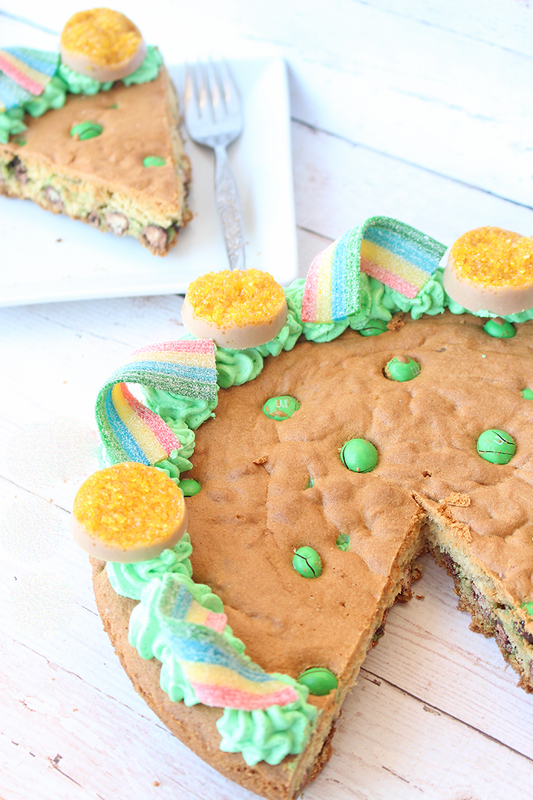 I was really worried about making it look St. Patrick’s enough – but I think we nailed it. I am so happy with how it looks, and my kids think its the best thing they’ve ever seen because hello, look at all the fun on this thing! 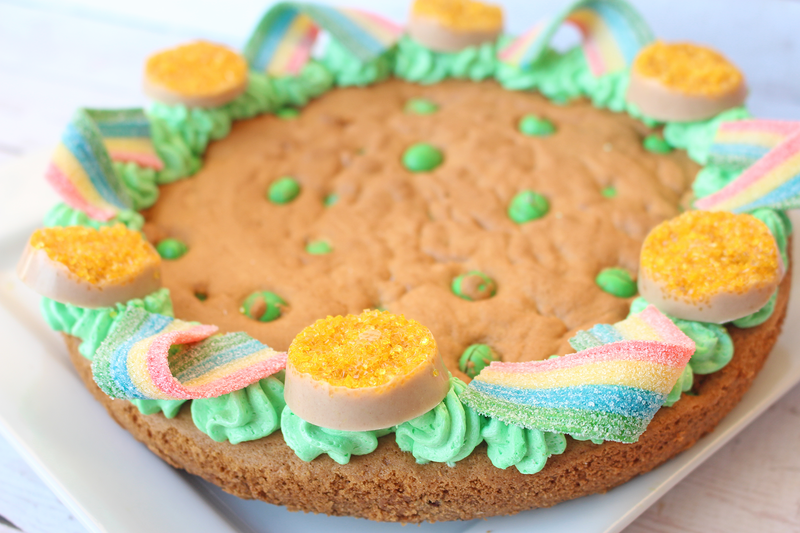 We have homemade little dollar coins/pots of gold, we have sour rainbow straps, delicious homemade buttercream frosting and crunchy green M&M’s throughout the cake! Talk about a whole lotta yum! Slowly mix the dry ingredients into the wet ingredients until just mixed. Chill your mixing bowl in freezer for about ten minutes. Add in sugar, factoring and blue only. Once blue is fully incorporated (scrape bottom and sides of bowl), turn on low and add yellow. 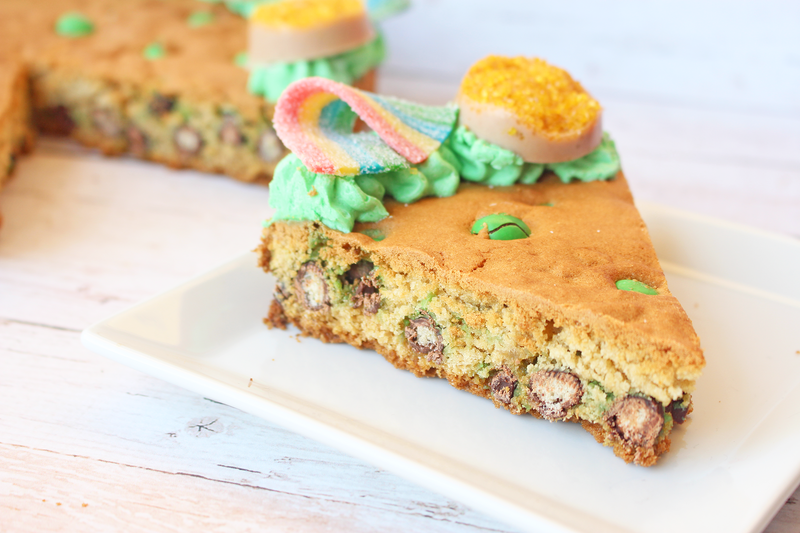 This delicious cookie cake can be made in any pan or skillet, it’s more like a deep dish cookie… so it’s fun to make it in whatever you can to keep it deep enough to be deep dish. We used a regular ol’ frying pan, as I don’t have a skillet at the moment. 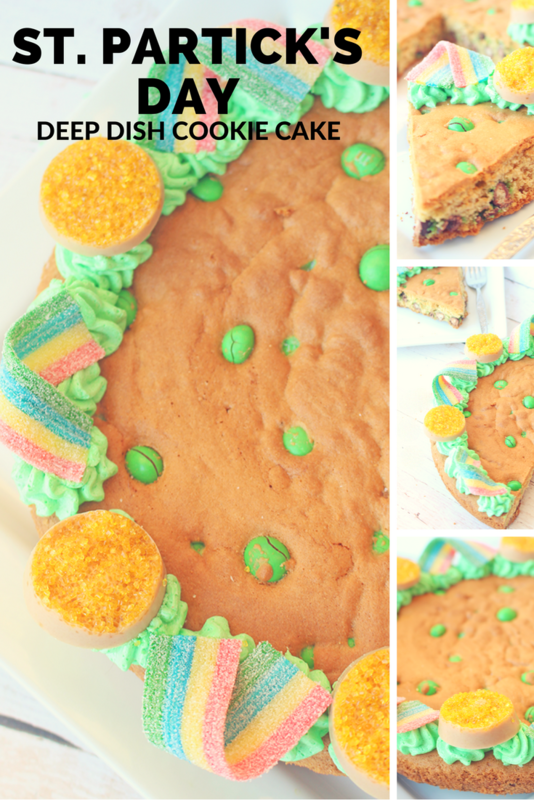 It slid right out after and was quick and easy to cool down to decorate just how we wanted it for the occasion! 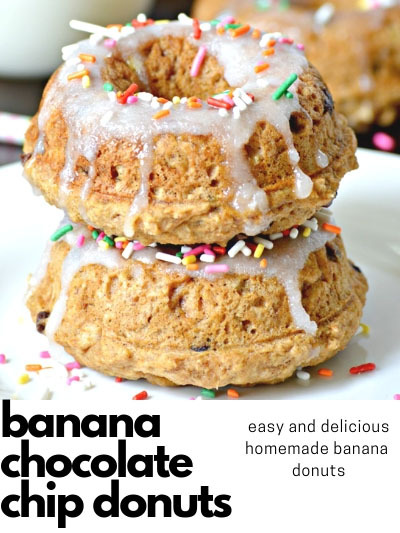 Even if you don’t celebrate St. Patrick’s day think about taking something like this to a get together, pot luck or even in to the office as a cheery little treat for your co-workers (or neighbours if you are like us and work from home!) 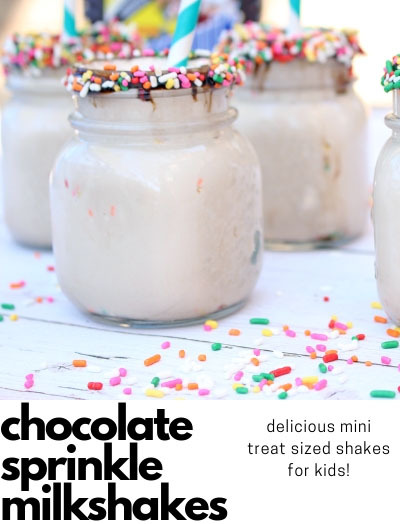 it’s a fun treat and big enough to share! Top with a little bit of french vanilla ice cream or leave it plain, as it’s just as delicious without the ice cream! We will be making this often as now our kids request it! They even wanted to take pieces of it to school but, we limit the sweets and just made sure they all had a sliver to enjoy – and boy did they ever!